When it comes to kitchen gadgets, the entire genre gets a lot of flack for being a waste of space and money. But now and then you come across a kitchen gadget that absolutely exceeds your expectations—like the Dash Rapid Egg Cooker. Before I even pitch the idea of purchasing a stand-alone electric egg cooker to you, I insist on opening with an apology to my wife. Several years ago she came home from the grocery store with the Dash Rapid Egg Cooker and I made merciless fun of it. It looked like the jankiest piece of plastic garbage this side of a B-movie prop shop and I was adamant there was no way it would cook eggs worth a damn. Not only was I wrong, but we’ve gotten a remarkable amount of use out of the device and have cooked hundreds of eggs in it so far. It might look like a piece of plastic junk you don’t want in your kitchen but it produces perfect eggs time and time again. The operation of the device is incredibly simple and despite my significant initial reservations about it, it works like a charm. It comes with several plastic inserts you place inside the UFO-like dome depending on the type of egg you want to cook—hard/medium/soft boiled, poached, omelettes, poached, or scrambled. While I still prefer to use a proper skilled for things like omelettes and scrambled eggs (not because the device fails at these tasks but because I’m usually cooking for multiple people) the Dash Rapid Egg Cooker is astoundingly good at making boiled eggs. You fill the little included measuring cup with a small amount of water based on whether you want the eggs hard, medium, or soft boiled, you put up to six eggs in the little egg carrier, latch the lid, press the button, and come back in 10-12 minutes to perfectly cooked eggs. Worried you’ll forget? Trust us, you won’t. The buzzer is so loud it would bring you back from the dead just to ensure the eggs don’t get overcooked. In the time it takes you to get your stuff ready to head out to the office you can have six perfect eggs to have for breakfast and healthy snacks throughout the day. I have yet to come across a more foolproof way to produce consistent eggs. 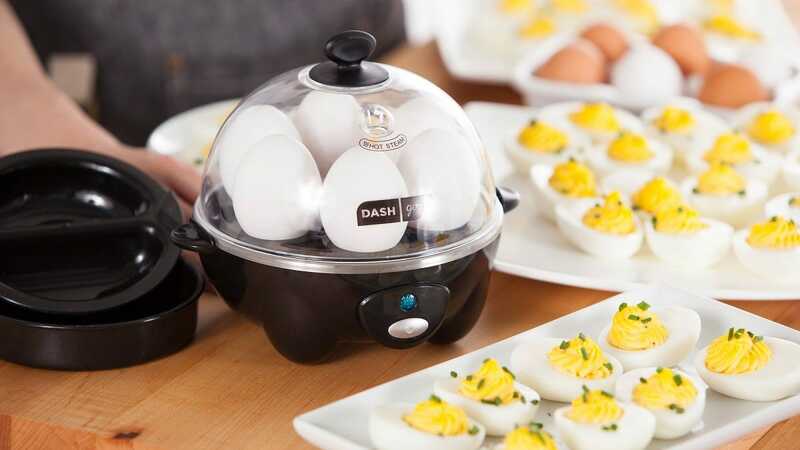 The Dash Rapid Egg Cooker is a downright steal at the $22-24 you usually find it at, but today it’s marked down on Amazon to $16.99 for a flash sale—which should make it even more of an automatic purchase for anyone who loves perfect boiled eggs.